We visited Sydney in August and on our last day in that great city we walked under overcast skies around the cliffs of Bondi Beach. One of the highlights of that stroll was coming across the belongings and ‘dwelling’ of the Bondi Caveman, Jhyimy “Two Hats” Mhiyles. My boys were intrigued that this man lived in a cave next to and nearby some of the priciest houses in Sydney. His ramshackle belongings spilled out across the grey rock. He had views to die for and he didn’t pay a cent. Like the Blanket Man in Wellington Jhyimy had become a local icon. A self styled poet, a harmless and intriguing tourist attraction. Yesterday the Waverley Council demolished his hut, and disposed of anything that looked like rubbish, while keeping in storage anything that looked like a ‘normal’ belonging. Jhyimy had recently been accused of sexual assault after luring a young woman to his cliff top home. So, now that he’s locked up and awaiting a trial the council has taken the opportunity to pounce and remove all trace of his presence. Waverley Council mayor Sally Betts denied the sexual assault allegations had anything to do with the eviction, though she admitted the case had probably made it easier to obtain the eviction order. It seems way too convenient to me. Check out the full story here on the Sydney Morning Herald website. He was stinking up the landscape. We’ve got equality in this country. That means if he’s allowed to do it, anybody can.Is that what we want? 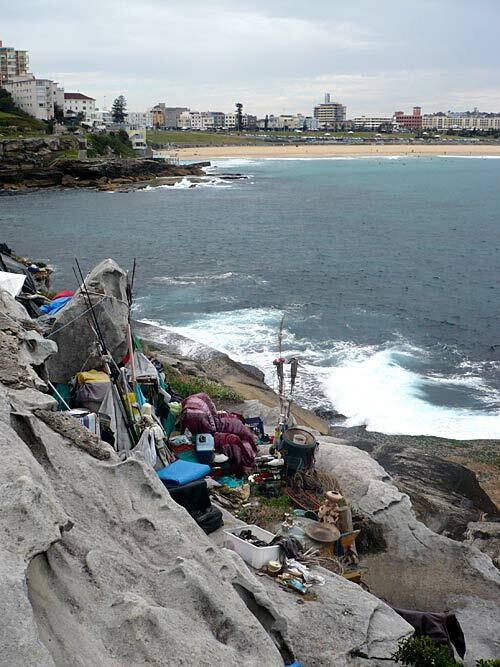 A colony of cave dwellers polluting a beautiful piece of coastline? “He was a nice guy”. Yeah right. How naive can you get?? ?